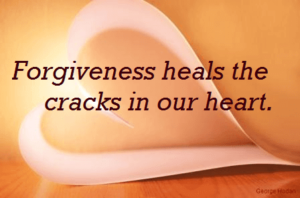 Forgiveness can sometimes feel impossible or even undesirable. Other times, we forgive only to be hurt again and conclude that forgiving was foolish. Both situations arise from confusion about what forgiveness really means. Forgiveness doesn’t require that we forget or condone another’s actions or the harm caused. In fact, for self-protection rather than anger, we may decide to never see the person again. Forgiveness doesn’t mean we justify or play down the hurt caused. Often, codependents forgive AND forget, and continue to put themselves in harms’ way. They forgive and then rationalize or minimize their loved one’s abuse or addiction. This is their denial. They may even contribute to it by enabling. “Forgiveness is releasing a prisoner and discovering the prisoner was you,” said Hilary Clinton. When we hold grudge, hostility can sabotage our ability to enjoy the present and our future relationships. Ongoing anger harms us and actually has negative health consequences. It raises blood pressure, impairs digestion, and creates psychological symptoms, such as anxiety, depression, and mental and physical pain. Forgiveness too soon may deny anger that’s needed for change. If we’ve been deceived, abused, or victimized, justified anger affirms our self-respect. It can motivate us to protect ourselves with appropriate boundaries. It helps us cope with grief and let go. It can smooth the progress of separation from an abuser. In divorces, usually at least one spouse is angry, facilitating the breakup. Initially, we hurt. If we’ve been betrayed or rejected, it’s natural to feel pain – just like a physical wound. We must experience it and cry without self-judgment. We need time to feel the hurt and loss that has happened and to heal. Once, we feel safe and have gone through stages of loss, it may be easier to forgive. Denial can make us forgive too soon or block forgiveness altogether. We should never deny, enable, or condone abuse. Denying that someone is an addict or abuser encourages us to continually accept broken promises, avoid setting boundaries, or stay in a toxic relationship. Denying that a loved one isn’t the ideal we want or imagined only feeds our disappointment and resentment. Accepting that you’re a partner or our parents are flawed, as we all are, can open the door to acceptance and forgiveness. If forgiveness is withheld too long, it can impede completing the stages of grief and lead to bitterness. Many codependents are uncomfortable with feeling or showing anger. Instead, they’re preoccupied with resentment and replay negative scripts and events in their minds. Resentment can disappear when we give ourselves permission to be angry and allow feelings of anger and sadness to flow. They may not even need to be expressed to the person who hurt us. Keep in mind that forgiveness relieves you of pain. It’s medicine for you. Think about the ways that resentment negatively holds you back and affects your life. You’re not responsible for someone else’s behavior – only your own. Consider your contribution to the situation. Perhaps you didn’t communicate your expectations or boundaries, provoked the person, or denied his or her capacity to hurt you. Try to see the person’s behavior and attitude from his or her point-of-view in the context of their life experience. Did he or she intentionally try to hurt you? In other words, develop empathy, but this doesn’t justify abuse or mean you should forget they’re capable of repeating it. Praying for the other person is effective. See the practice described in my ebook, Spiritual Transformation in the Twelve Steps. Sometimes we must forgive ourselves before we’re ready to forgive someone else. We often blame others when we feel guilty. We can hold onto resentment to avoid accepting responsibility for our actions or to avoid feeling guilty. Although it’s important to reflect upon and take responsibility for our contribution to the problem, we need to forgive ourselves for any part we played. It may be harder to forgive ourselves than someone else. If you continue to feel guilty, do the exercises in Freedom for Guilt and Blame: Finding Self-Forgiveness. Reconciliation may or may not follow forgiveness. If we were hurt by someone close to us and want to maintain the relationship, then reconciliation might require their taking responsibility for their actions, making amends, and an agreement not to repeat their behavior. See my blog, “Rebuilding Trust.” If trust was deeply broken with deception or an affair, couples counseling may be necessary in order to heal. Sometimes, the relationship is stronger as a result. That is a great article, vey helpful. All to often forgivness is equated with "letting the other peson off the hook" , but the point is to open the door to the jail cell that contains YOU and walk out of prison. Thank you!